This is an extremely clever Penetration effect, where a solid wooden plate penetrates right through the performer’s, or a spectator’s finger. This is the prop that inspired our stage version of the item (Plate through Arm Penetration) advertised earlier. This handy model can be carried in your pocket, and is ready to use any place, any time. It is suitable for presentation before a young audience, where other Finger Chopper effects utilizing knives or blades would not be suitable. The apparatus supplied comprises of a wooden plate with a hole, and a split frame with a hole into which the plate fits. The frame has a flexible joint at the bottom and will open out, allowing you to show the frame empty in a most convincing manner. You display the apparatus, removing the plate from the frame, showing the frame clearly empty, and the plate freely on both sides. Draw up the plate, and place your finger through the hole in the frame. Or you could have a spectator place their fingers through the hole. Press down the plate by the handle, – you have the perfect illusion of the plate penetrating the finger. 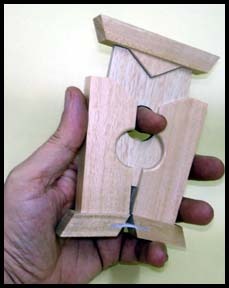 Then split the frame on top wide enough, so that the finger and plate can be moved up and out of the frame, with the plate having clearly penetrated onto the finger, as illustrated. This is a very clean and convincing penetration effect. The ingenious construction of this prop makes this almost work itself. And it comes to you at a very affordable price.